We will host Choralfest 2017 the week of July 24-28, with a theme of The Wild, Wild West. 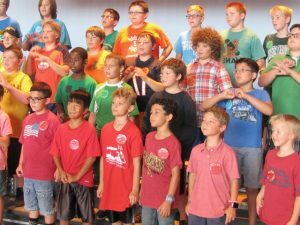 The week-long day camp at the IPFW Rhinehart Music Center will welcome nearly 300 FWCC new and returning members to a week filled with music and more. The annual camp is the kick-off event for the upcoming FWCC choir season! 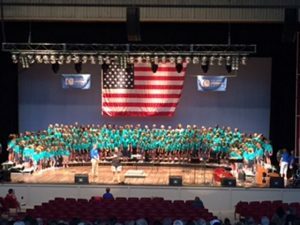 Seven of the nine ensembles will meet as individual choirs and as a combined group. The week serves as an opportunity for the singers to meet one another or renew friendships, begin their work as a choir, and experience other areas of the arts through various activities and guest artists. This year Choralfest will offer chimes, contradancing, drama, and music theory, in addition to the many opportunities to sing. The week culminates in a free public concert in the Foellinger Outdoor Theatre, Franke Park, Friday, July 28, 7:00 pm. FWCC Alumni will join the current singers on stage during the final song of the evening. The performance is part of the Fort Wayne Parks and Recreation music series and is open to the public.